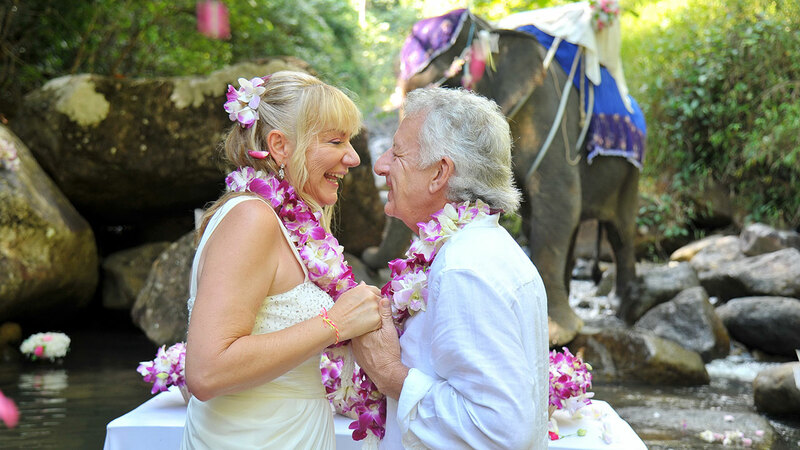 Our Elephant Wedding Package is one of our most highly recommenced and memorable ceremonies held deep inside one of Thailand most beautiful tropical rainforest, well known for its fauna and flora, wild life as well as the largest flower in the, world.the rafflesia. Your wedding day will begin with members of our staff and our hair beauticians will come to your hotel.for preparing the hair dressing and make up the bride and groom. After finished the make up, we then will take you by chauffeur driven car to the location in Phang nga’s Tone Pariwat wild life national park sanctuary. After the rights have been read you then receive the rings on a beautiful bouquets of flowers and then the traditional kiss of the bride and groom with beautiful setting and in the middle of the shallow river water we have a table prepared with the with flowers and a bottle of your choice of champagne, you then toast and flowers petals will them be showered over you by our staff, our your members of you family or friends that may be attending your wedding.